I like to think that we are a tolerant flock. Choppers, bobbers, street fighters, bone stock restorations, we're all accepting here. And if your sense of style is well, a little out there, who are we to judge? But some things are just not right. Would you accept high rise bars on a drag machine? Purple moon glow paint on a Brough Superior? 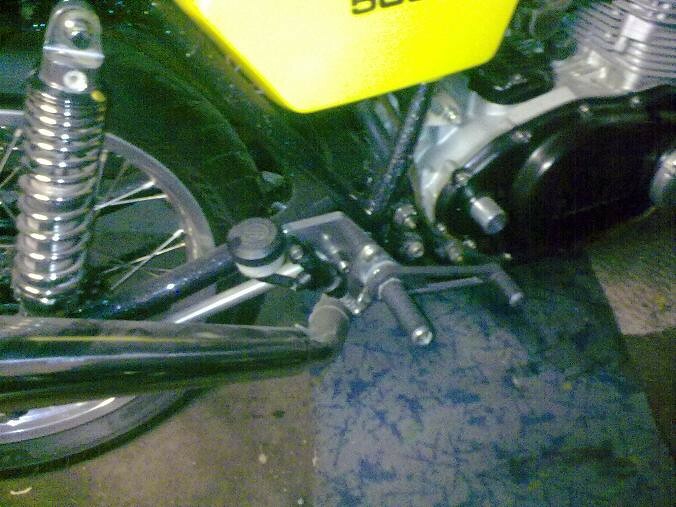 So it is with some trepidation that we present Mike's very road capable machine-with Harley brake parts. I hear the gasps among you, brothers! Mike is a self described "nutter" when it comes to Yamahas. "The bike is a 1979 model. It has been modified quite a bit and a lot of the bits have come from the states. 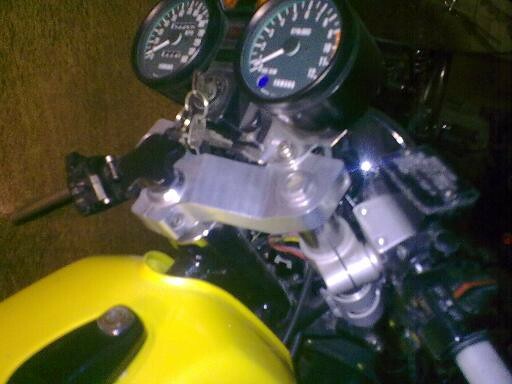 This project as you can see is waiting for stainless brake lines, head light wiring and grips." " Firstly the frame has been totally renovated, ie: stripped, shot blasted and painted in metal flake black. The clipons, rearsets and alloy body rear shocks came from the states." "Both wheels have been totally rebuilt in 18 inch alloy rims and stainless spokes with new avon tyre and tubes. Two large floating discs with brembo 4pot calipers on both sides. 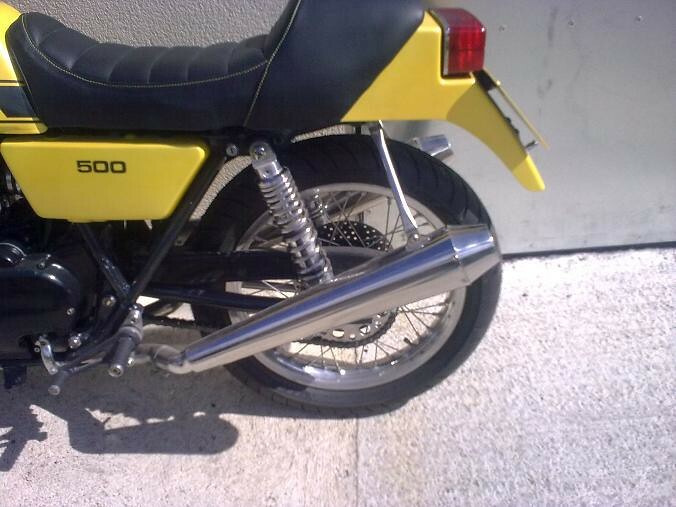 The forks are from a TZ Yamaha with reduced alloy legs where possible. "The seat is hand made leather with yellow stitching and foam cut to new form. The exhaust is a one off with stainless reverse cone silencers. The two front pipes are joined underneath. " "The spends so far are in excess of £4000 and still climbing. 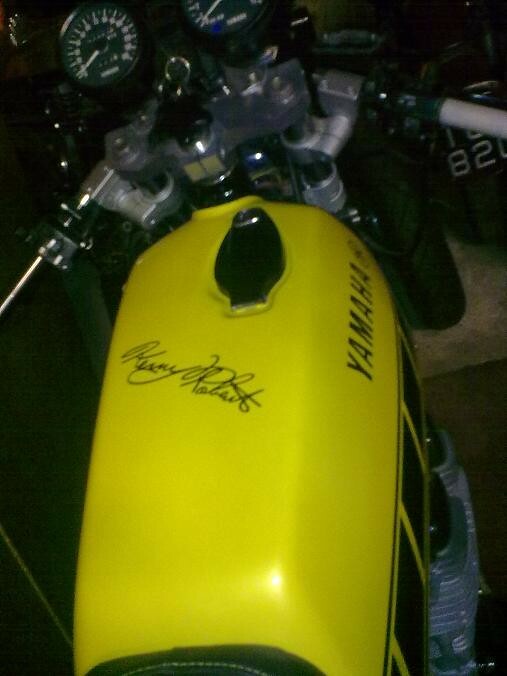 There is a Kenny Roberts signature on the tank under lacquer." Seriously Mike, thanks for sharing this outstanding example. Members, can we forgive him? That's really cool.... I love the 18" alloy rims and the brake setup. The TZ front end is killer! 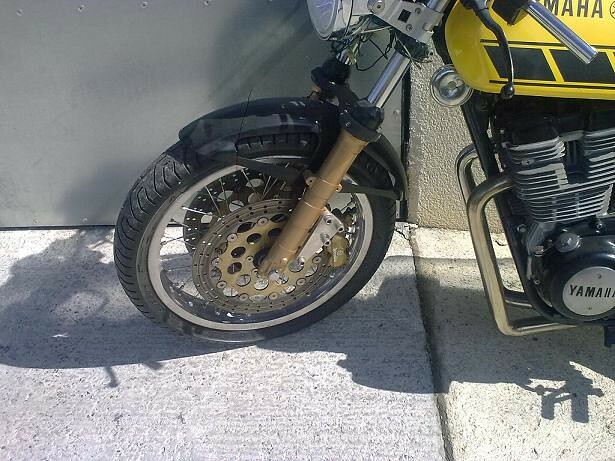 Good job, Harley parts or not! This is a beautiful machine! I'm drooling over the billet triple tree top. 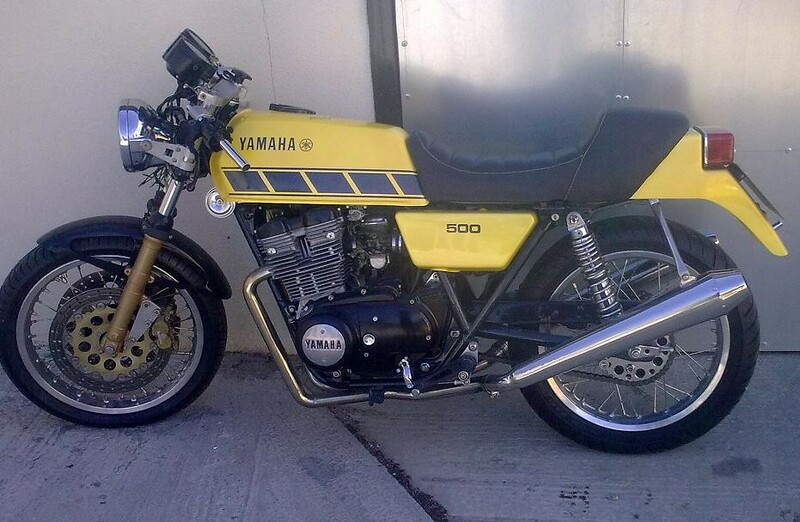 Love the classic Yamaha racing yellow!